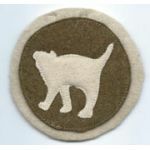 WWI 110th Trench Mortar Patch. Greenish wool background, with heavy gold bullion embroidered mortar. Used. 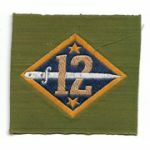 WWI 12th Division Liberty Loan Patch. Silk woven. Unused. WWI 14th Combat Engineers Patch. Beautiful hand stitched details on a black velvet background. Unused. WWI 14th Combat Engineers Patch. Black wool background with beautiful hand embroidered details. Unused. 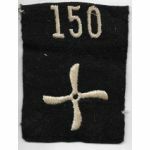 WWI 150th Aero Squadron Enlisted Patch. White hand embroidered details on a dark wool background. Unused. 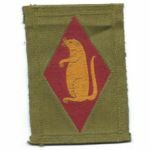 WWI 156th Field Artillery 81st Division Patch. Multi-piece construction, on wool. Unused. 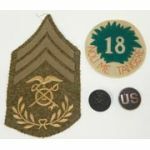 WWI 161st Infantry Regiment 81st Division patch. Multi-piece wool construction. Unused. WWI 164th Field Artillery Brigade 89th Division LIberty Loan Patch. Silk woven. Unused. 1903-1918 Hospital Corps Sergeant Chevron. Dark wool background with maroon chevrons and white embroidered details. Unused. 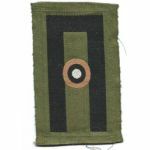 WWI 19th Division Patch. Multi-piece wool construction. Used. WWI 1st Army Aviation Liberty Loan Patch. Silk woven. Unused. 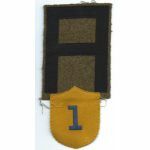 WWI 1st Army Gas Regiment Patch. 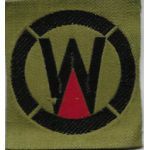 Multi-piece wool 1st army patch with a gold wool shield sewn to the bottom. Used. 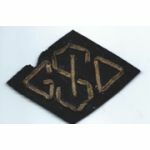 WWI 1st Army General Intermediate Supply Depot Bullion Patch. 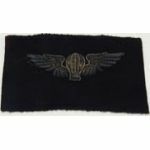 Black wool background with German bullion embroidered details. Unused. 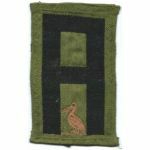 WWI 1st Army General Intermediate Supply Depot Patch. Black wool background with chain stitched details. German bullion border. Unused. 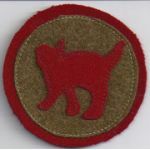 WWI 1st Army Motor Transport Corps Patch. Machine embroidered on wool. Unused. 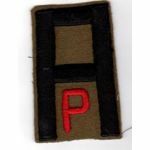 WWI 1st Army Pioneer Troops Patch. Soft, od wool background. Has hand embroidered silk A & P. Unused. WWI 1st Army Railway Artillery Reserve Liberty Loan Patch. Silk woven construction. Another tougher to find variant. WWI 205th Infantry Regiment Liberty Loan Patch. Silk woven. Unused.